Amid growing concerns whether upcoming elections in Greece will lead to the country exiting the euro zone, an EU Commission spokesperson said membership cannot be revoked. European Commission spokesperson for Jobs, Growth, Investment, EMU (Economic and Monetary Union) and the European Semester, Annika Breidthardt called membership "irrevocable" during a press briefing on Monday. Commenting on Greece's possible exit - dubbed "Grexit," the Brussels official refused to speculate on the topic, saying there is no legal mechanism to be applied for the country to leave the euro zone. The remarks followed a Sunday article in Germany's Der Spiegel magazine, which said that Germany believed the euro zone was stable enough and had sufficient rescue mechanisms to survive the potential ramifications of Greece leaving the single currency union. Citing sources in the German government, the journal report said that both Chancellor Angela Merkel and Finance Minister Wolfgang Schäuble thought the potential Greek exit "manageable." Germany's Vice Chancellor and Economy Minister Sigmar Gabriel later said Germany wanted Greece to remain in the euro zone and there were no plans to the contrary, Reuters reported. "If [Grexit] happens, it will point out that EU cannot solve any kind of problems in the context of the mechanism that it has invented, this will be very bad for the euro in any case," Dimitri Mardas of Aristotle University of Thessaloniki told RT, although adding he did not believe the country's exit was a "real case." On Monday, the issue was also addressed by French President Francois Hollande, who said it was "up to Greeks" to decide whether to stay or quit the single currency union. "As for Greece remaining in the euro zone, Greece alone can decide," Hollande said in an interview with France Inter radio, as quoted by Reuters. He added that the nation was "free to determine their own destiny." Hollande's opponent, the leader of France’s right-wing National Front party Marine Le Pen recently called globalization a "barbarity," being just one of a growing number of euroskeptics within the EU. Experts say it's the domino effect that should be taken into consideration, with "Grexit" possibly leading ways for other countries to follow. In Britain, Prime Minister David Cameron promised last year to hold a vote on Europe in a referendum by the end of 2017 if the Conservatives win the next general election. Cameron has been under domestic pressure from politicians to quit the EU sooner. 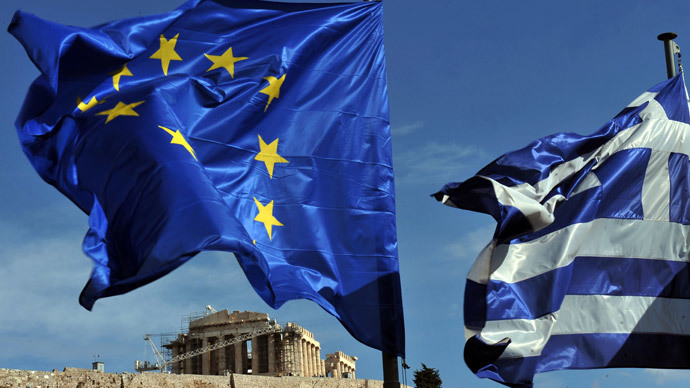 The question of Greece exiting the euro zone has come into focus ahead of a parliamentary election in the country, scheduled for January 25. At the moment, the country's left-wing opposition party Syriza is seen narrowly but leading the opinion polls. If elected, euroskeptic party leader Alexis Tsipras has promised to end austerity policies and ask Europe to erase a big portion of the Greek debt. The current Prime Minister Antonis Samaras warned earlier this week that if Tsipras’s party wins, it will lead to a default and force Greece to leave the euro zone.